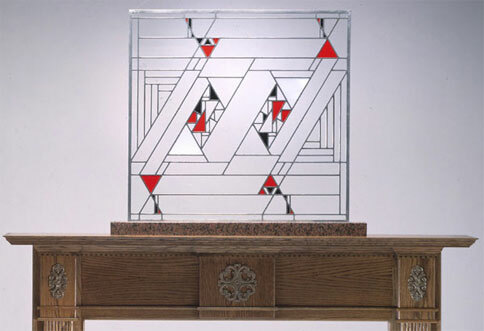 With angular geometric shapes, the Midway Gardens "Dancing Glass" window was designed by Mr. Wright but never made. Our studio's window marks the first time this design was released from the archives for production. Red, black, opal flashed glass combined with clear; handcrafted in solid zinc channel construction, floated with silver and tin.